This stuff hits the spot. Spicy and flavourful. I’m a lazy sod. I don’t do much that makes me break a sweat. Mowing the lawn is one notable exception. The other is eating gumbo. It’s not that I exert great effort in its consumption. It’s because of its wonderful spiciness. 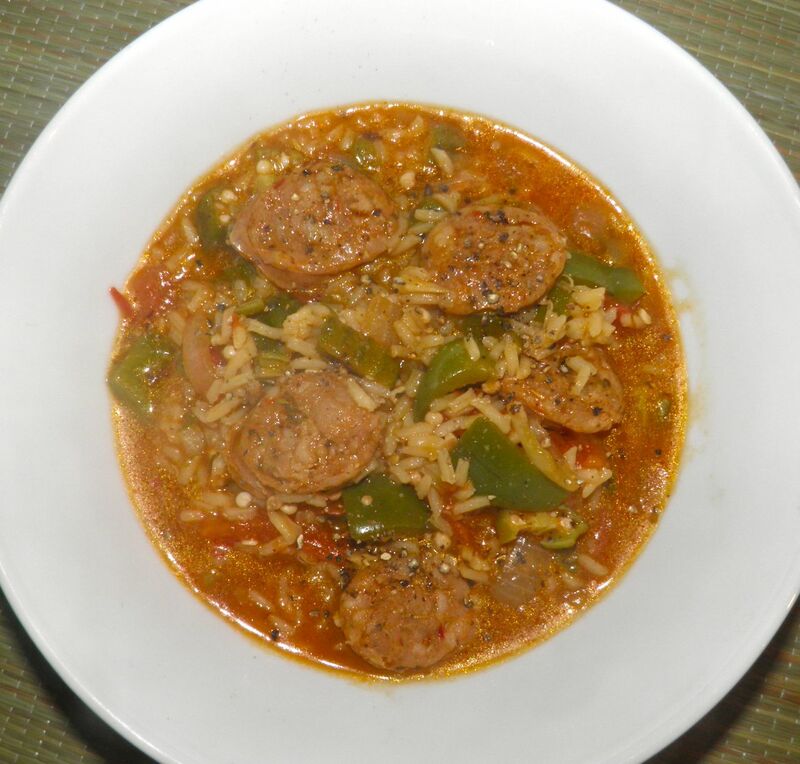 This gumbo isn’t really all that hot, and you can adjust that heat up or down. But I do enjoy that runny nose and damp forehead every once in a while that spicy food causes. Your body responds to spicy foods the same way it does to a hot day. It tries to cool down however it can. In most cases it breaks out in a sweat. The spiciness in my gumbo is from hot pepper in the sausage and jalapeno. from chilli peppers and (I assume) turmeric. Spicy food, within reason, is good for you. Most of the “spice” in spicy food is from hot peppers. Peppers contain capsaicin, the chemical compound that is the cause of the heat. Different peppers have varying amounts. Capsaicin can aid in weight loss because it speeds up metabolism. It helps the body dissolve blood clots. It improves circulation and lowers blood pressure. Studies have also shown that regular consumption of chillies can lower your risk of cancer. But it doesn’t stop there. Spicy food improves digestion and can aid in sleep. If you have a cold or the flu food that makes you sweat can ease the discomfort of symptoms. Hot peppers also act as an expectorant, making it easier to breathe if you have asthma. So there’s a lot of health reasons to break a sweat at the dinner table every so often. I have to say that I love Cajun food. Jambalaya and gumbo are two of my favourite dishes. I love their depth and complexity. When I found fresh andouille sausage (at the Atlantic Superstore!!) I was in heaven. The thickener in this dish is okra. I used to be disgusted by okra but have grown out of that phase. To benefit from its thickening action you have to cook it until the gooey, stringy, snotty-looking stuff comes out. Gross, right? No… delicious. This dish is actually quite inexpensive. The sausage—enough to feed four—was $4.50; the fresh okra under $2; a bell pepper $1.50; a few tomatoes about $2. I think the jalapeno cost me 16¢. The rest of the stuff you should have on hand. If you like, serve with hot sauce at the table for those souls that really like their heat. By the way, of you don't like the effects of spicy food, drink milk. Milk binds to capsaicin more readily than capsaicin binds to your tongue. So it instantly relieves the spiciness. Water does nothing to reduce the sensation except dillute it temporarily. So bring on the gumbo, with a glass of healthy milk on the side! adds lots of flavour to the gumbo. Place about 1” of water in the bottom of a soup pot. Add the sausages and bring to a boil. 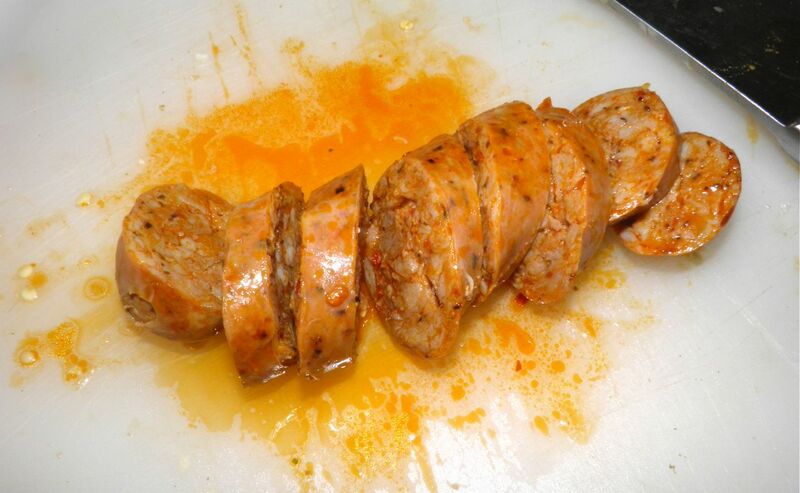 Let simmer for about 5-6 minutes to partially cook and firm up for easier slicing. Remove the sausages and let them cool. Chop the vegetables while the sausages cook. Empty the remaining water from the pot and add the vegetable oil. 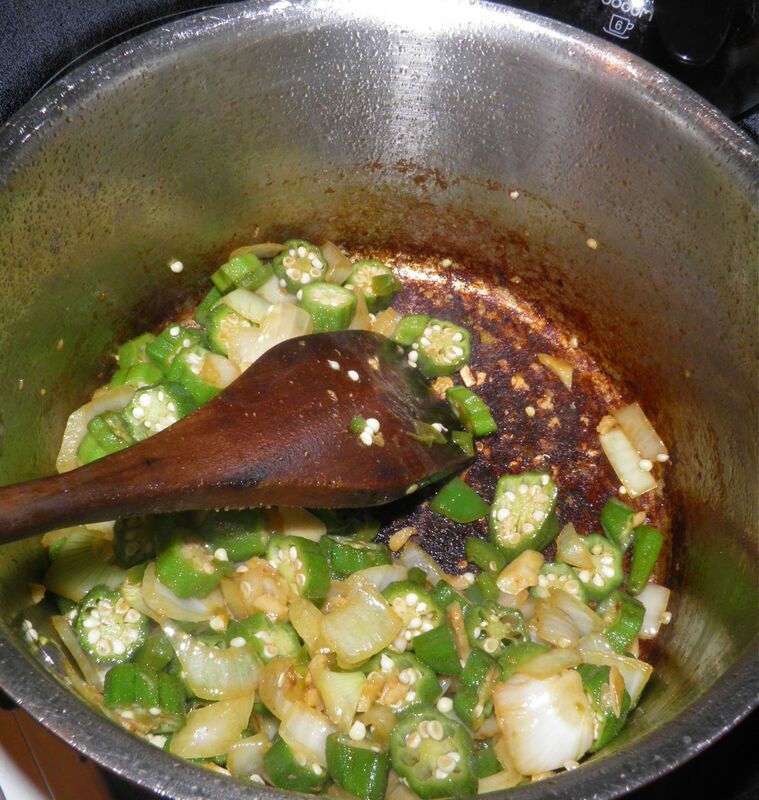 When the oil is hot, add the garlic, onions, sliced okra and jalapeno. A pot of gumbo is a wonderful sight in the kitchen. If the mixture starts to brown on the bottom of the pan don’t worry. That will also add flavour to the soup. Once the okra is no longer ropey add the stock. Slice the sausage into bite-sized pieces and add back to the pot. 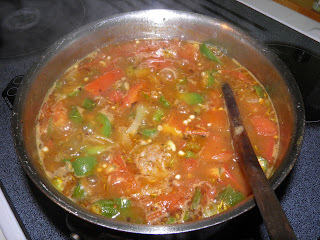 Then add the tomatoes, green pepper and rice. Stir well and add the spices. Bring to a boil, reduce the heat to medium and cook for 20 minutes. Stir occasionally. Taste for seasoning and adjust. If the gumbo is too dry add the remaining stock and bring back to a simmer. Then serve.